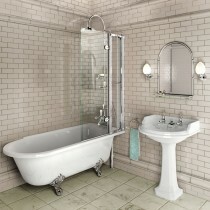 Choose Elegant Burlington radiators, bath tubs, shower enclosures, and other sanitary ware. Sophistication and classic elegance best describe all the products offered by Burlington Bathrooms. Burlington are an esteemed brand of bathroom supplies, all Burlington products imbibe the panache of classic, popular 19th-century British designs for their unique richness. The fusion of traditional designs with functional innovations is clear on Burlington radiators, bath tubs, shower enclosures, and other sanitary ware. Burlington Bathrooms have spruced up their inventory to match the current customer needs and all you need to do is just browse through the offerings to make a decisive choice!